In Dictators Without Borders: Power and Money in Central Asia, Alexander Cooley and John Heathershaw look at the under-explored financial reach of the ruling elites of five Central Asian states – Kazakhstan, Kyrgyzstan, Tajikistan, Turkmenistan and Uzbekistan – who reap the benefits of globalisation while denying civil liberties to their own populations. Anton Moiseienko welcomes this book for combining high-quality scholarly research with an urgent and powerful moral message. 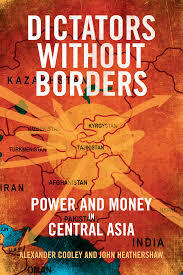 Dictators Without Borders: Power and Money in Central Asia. Alexander Cooley and John Heathershaw. Yale University Press. 2017. While the reality of globalisation is universally acknowledged, its workings are not always obvious. Dictators Without Borders: Power and Money in Central Asia by Alexander Cooley and John Heathershaw sets out to show how appearances can be misleading and how the deceptively isolated post-Soviet region of Central Asia is in fact deeply embedded in the fabric of globalisation. Dictators Without Borders offers a poignant account of how the ruling elites of Central Asian countries reap the benefits of interconnectedness while denying civil liberties to their populations. It also argues that all too often foreign corporations are keen to seize on dubious business opportunities in the region while Western governments remain complacent. Dictators without Borders deals with the five Central Asian states: Kazakhstan, Kyrgyzstan, Tajikistan, Turkmenistan and Uzbekistan. All of them share a Soviet past and faced similar challenges on the path of transition to market economies. Despite some marked differences in their post-1991 experiences, in each of these countries, Cooley and Heathershaw argue, the national economies have been brought under the control of tightly-knit networks based on family ties and patron-client relationships. The book is structured around four case studies. One of these revolves around the US prosecution of three mammoth telecom companies for transferring about US$684 million in bribes to the unnamed ‘Government Official A’ in Uzbekistan. This official is reported to be the late President Islam Karimov’s elder daughter Gulnara, a one-time pop star and Uzbek ambassador to Spain (129). After criminal charges against the companies were settled out of court, the US Department of Justice is continuing to seek civil forfeiture of approximately US$550 million in alleged bribe proceeds that had been stashed away in a Swiss bank. The protagonists of Dictators without Borders also include other members of the ruling families from Central Asia as well as the absconded Kazakh banker Mukhtar Ablyazov, who has been accused of owing around US$4 billion to the bank that he once ran. autocratic elites and their allies routinely use the professional services and institutions of the West to elevate their status, play up their cosmopolitanism, relocate personal funds and camouflage their identities (220). A sceptical reader might question the novelty of these insights. After all, the notion that the wealthy across the world use offshore companies to conceal their assets is hardly new. Nor will anyone be surprised by the finding that real estate in places like London is probably an attractive investment, or that the rich and powerful tend to retain top lawyers and PR firms and vigorously defend their reputations. In a sense, one could say that Dictators without Borders confirms something that the public has already known about developing countries in general – albeit without awareness of the specific Central Asian circumstances. However, the authors convincingly argue that – surprising as it might be – the importance of international financial ties in Central Asia has not been fully appreciated or acted upon up until now. Far from being redundant, such a study is in fact long overdue. By spelling out how cross-border activities can sustain domestic corruption in the long run, it points out the elephant in the room and calls for action. The involvement of foreign facilitators and intermediaries in illicit cross-border flows means that developed nations, including the UK, are in a position to curb them by enforcing laws against money laundering and foreign bribery. The most disturbing part of Dictators Without Borders is its account of what it terms ‘extraterritorial internal security’: namely, attempts to silence or punish dissidents and whistleblowers living abroad. The text abounds with examples of the dangers that haunt those who dare to challenge the wrongdoing of powerful officials. By making explicit the link between economic wrongdoing and other sorts of abuse, the book brings the human costs of corruption to light. It describes how even the exiles who find refuge in European countries remain at risk, especially when their home states seek their extradition on trumped-up charges through Interpol’s Red Notice system. Ensuring that Interpol and the courts prevent such abuse should be another priority. In the past few years, several noteworthy books have been published that shed light on dysfunctional governmental practices in various parts of the world, among them works by Sarah Chayes and Karen Dawisha. Without a doubt, Dictators without Borders is a welcome addition to this literature. Besides all the usual hallmarks of high-quality academic work, a particular merit of this book is the sense of urgency that it conveys by combining scholarly analysis with a clear and powerful moral message. Anton Moiseienko is a PhD candidate at the Criminal Justice Centre, Queen Mary University of London. He writes about the fight against corruption and international law. Read more by Anton Moiseienko.